Warriors & Warlocks takes the Mutants & Masterminds RPG beyond superheroics to the realms of sword-wielding warriors and sinister warlocks, to fantasy worlds where your heroes can adventure. 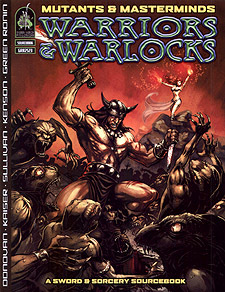 Warriors & Warlocks is a guide to the sword & sorcery comic book genre, featuring information on character design, magic, equipment, villains, monsters, and more. Heroes! Detailed guidelines on creating your own sword & sorcery heroes using the M&M rules for a variety of power levels: heroic (PL 6), cinematic (PL 8) and epic (PL 10 and beyond). Villains! Ready-made archetypes for fantasy villains, from the Black Knight and Evil Sorcerer to the Master Assassin and Undead Overlord. Monsters! A wide selection of malevolent minions and corrupt creatures to supplement the archetypes from M&M and round out your fantasy foes roster. Magic! Different ways of handling magical powers, from spell-casting wizards to demon-summoners and demigods, plus magical items and devices. Adventure! Not one, the Three fantastic worlds of adventure: the pirate city of Freeport, the high-fantasy world of Freedom's Reach, and the primeval Lost World, all ready for your heroes to explore. Take your Mutants & Masterminds adventure to exciting new worlds and create your own tales of sword & sorcery with Warriors & Warlocks.